Click on the To..., Cc... or Bcc... buttons to open the address book. Select Contacts in the drop down menu. Select a contact in the contact list by using the select checkbox next to the contact. Next click on the To..., Cc... or Bcc... buttons to add the selected contact to the relevant field. Click OK to return to the compose message window. Select Global Address List in the drop down menu. Note: Global Address list is an exclusive feature to the Enterprise version of the web mail interface. Please inquire with your administrator for more information. 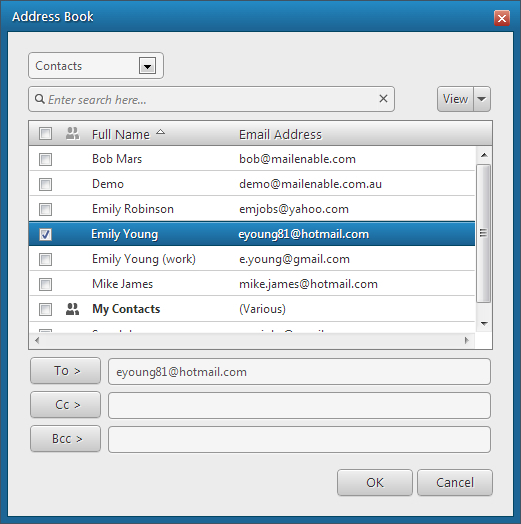 Search The contacts search option can be used to search contacts within the mailbox contact list or the Global address list. Tip: You can sort the Address Book using the sorting columns.